Created after a year of research and drawing on MS Paint and Photoshop. I've posted them before but this shows all three together one one canvas; I have it framed and up on my wall. They were so glorious! It’s a real shame only Olympic survived to see anything beyond the 1910s. Shame Titanic and Britannic sank. They were beautiful ladies. Yes indeed! We are lucky that we can still visit and learn from them though, unlike Olympic! 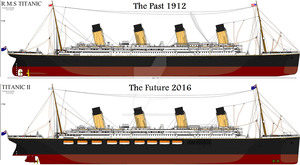 Is Britannic the same class even though its lifeboats were modified? Yes the three sisters were all the same class. the funnels were slightly taller and had a more lighter buff color. The color of the propeller hubs and the funnels is still open to speculation, as is the Anti-fouling color. This is simply my interpretation. Also I am sure I got the funnel height correct, having done much research on the matter. Thanks for your suggestions, though! also after reading them, please tel me if there was any testimony regarding the third funnel collapse since i heard that people only saw the 1st, 2nd and 4th funnels fall but not the 3rd. the astern A promenade deck was different on the britannic, the windows of the smoking room was not really like this. You could be right, but I've yet to find any tangible evidence that the windows were different. Thanks wingstopboy! That means a lot. Great side views! They are very detailed. I joined your facebook group a little while back so its nice to see you on Deviant Art! These just boggle my mind. Hey thanks a lot mate! I'm a great fan of your classic SB scale Olympic class drawings.